Not of the olive variety. 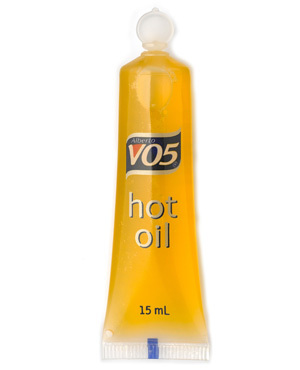 This morning I tried VO5 hot oil before washing my hair, I picked it up yesterday from my second home - Boots. I was a little dubious at first because it was only £2.18 for 4 tubes of it and I was thinking "hmmmmm, but theres an intensive conditioner over there for 8 quid and it must be better?" NO, don't got for that over priced leave in conditioner give these little beauties a try first. Pop one out of the packet and stick it in a cup/sink of hot water for 60 seconds to heat it up. While it's got its feet up with a cuppa chilling out wet your hair thoroughly. Get the tube from the hot water, pop it open and massage it into your hair. I concentrated on the ends of my hair as they are in the worst condition, then worked it through the rest of my hair. The pack comes with strict instructions not to leave it on for more that 1 minute as it's an intensive treatment it can cause irritation of left on any longer. So I was sharpish & left it on for about 59 seconds. You can't really notice any difference at first but when I was rinsing my hair it did feel a bit thicker. Once you have rinsed your hair wash and condition as normal. Normally after drying and straightening I use a spray to add some shine to my hair but I was in a rush to meet and friend and forgot to put it on before leaving the flat. When I met her she commented immediately on how shiny and nice my hair looked today. RESULT. So, if you need any more proof that this is the shizzle go out and grab a box for yourself!